Figure 20. Lighter, fuse, friction-type, J11. pull on the loop, or handle at the closed end. ignites the powder that, in turn, fires the j>owder t rain in the fuse. To prevent pulling the fuse lighter from the fuse and causing an air gap between the fuse end and the lighter, hold the body of the lighter in one hand and pull the igniter wire with the other. If any doubt exists as to whether the fuse is burning and the length of fuse will permit time, pull the fuse lighter off the fuse by force immediately after pulling the igniter wire. The weatherproof fuse lighter M2 (tig. 21) consists of a barrel that holds the firing mechanism and a base that contains a percussion cap and has a pronged fuse retainer. 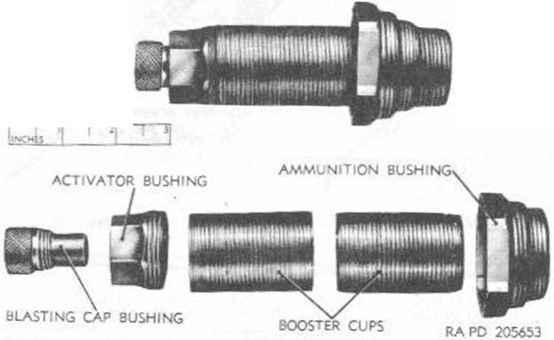 The barrel contains the striker spring and striker, held locked in one end by a release pin. The other end is threaded to fit over the base. Plastic sealing material is used to waterproof the joint of the safety fuse (or time blast ing fuse) and fuse lighter. When the release pin is pulled, the striker strikes the percussion cap that, in turn, ignites the fuse. The lighter will ignite the fuse under all weather conditions, even under water. Figure 21. iAghter, fu*e, weatherproof, M2. a. General. This fuse is standard for general use in military demolitions. It. 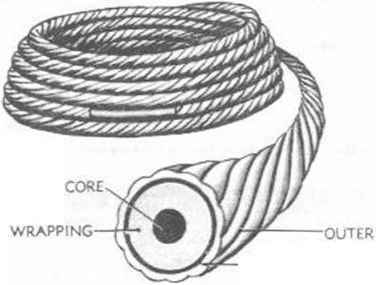 is in the form of a cord, 0.20 inch in diameter, it is dark green in color and smooth, with abrasive markings at 18-inch intervals that correspond to approximately 1 minute each of burning time. When ignited by an ordinary match or a fuse lighter, it transmits a flame to a nonelectric blasting cap, which may be installed in a high-explosive charge, either on land or under water. 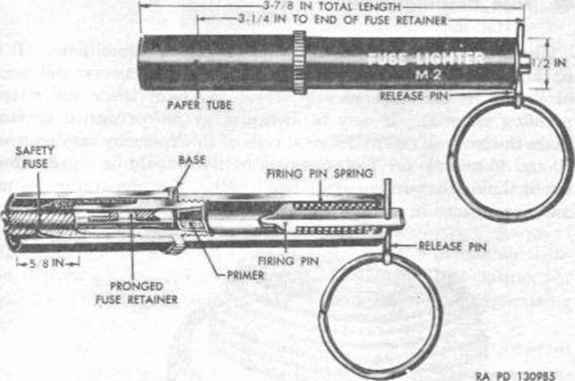 The fuse, which has a black powder core, burns approximately a uniform rate of 40 seconds per foot, allowing the person liring a charge to walk to h place of safety before the charge explodes. b. Preparation for use. In preparing to attach a nonelectric blasting cap, first cut oil" «Ixiut 2 to 3 inches of fuse and discard. Cut the fuse squarely in the place provided in the jaws of the blasting cap crimper (par. 87). The fresh end of the fuse must be inserted firmly into the open end of the nonelectric blasting cap, then the cap crimped in the place provided in the jaws of the crimper. c. Precaution* in Storage and Handling. The fuse should be stored in a cool, dry place free from oils, paints, gasoline, kerosene, and similar distillates and solvents. In handling the fuse, avoid twists, kinks, or sharp bends that may crack the covering or cause breaks in the powder train of the fuse. The fuse is limited standard for use in general demolitions. It is in the form of a con! approximately 0/20 inch in diameter and has a black powder core covered with several layers of fabric and waterproofing material. It may be identified by its corrugated surface. Since the burning rate of different rolls of this fuse may vary between 30 and 45 seconds per foot, each roll of fuse should be tested l>efore use by timing the burning of a 1 -foot length. For preparation for use and precautions in storage and handling, see paragraph 446 and c.
What is a military fuse lighter?